In 1990 then-president F.W. de Klerk began to dismantle the apartheid legislation. In 1994 South Africa held its first democratic election. Nelson Mandela and the African National Congress (ANC) came to power, and the country rejoined the Commonwealth of Nations. South Africa is known for its diversity in cultures, languages, and religious beliefs. Eleven official languages are recognised in the constitution. English is the most commonly spoken language in official and commercial public life; however, it is only the fifth most-spoken home language. South Africa is ethnically diverse, with the largest Caucasian, Indian, and racially mixed communities in Africa. Although 79.6% of the South African population is Black, this category is neither culturally nor linguistically homogeneous. People within this classification represent a variety of ethnic groups and speak a number of different Bantu languages, nine of which have official status. Midyear 2007, the South African population was estimated at 47.9 million. South Africa contains some of the oldest archaeological sites in the world. Extensive fossil remains at the Sterkfontein, Kromdraai and Makapansgat caves suggest that various australopithecines existed in South Africa from about three million years ago. These were succeeded by various species of Homo, including Homo habilis, Homo erectus and modern humans, Homo sapiens. Settlements of Bantu-speaking peoples, who were iron-using agriculturists and herdsmen, were already present south of the Limpopo River by the fourth or fifth century (see Bantu expansion), displacing and absorbing the original KhoiSan speakers. They slowly moved south. The earliest ironworks in modern-day KwaZulu-Natal Province are believed to date from around 1050. The southernmost group was the Xhosa people, whose language incorporates certain linguistic traits from the earlier KhoiSan people, reaching the Fish River, in today's Eastern Cape Province. As they migrated, these larger Iron Age populations displaced or assimilated earlier peoples, who often had hunter-gatherer societies. In 1487, the Portuguese explorer Bartolomeu Dias became the first European to reach the southernmost point of Africa. Initially named the Cape of Storms, The King of Portugal, John II, renamed it the Cabo da Boa Esperança or Cape of Good Hope, as it led to the riches of India. Dias' great feat of navigation was later immortalised in Camões' epic Portuguese poem, The Lusiads (1572). In 1652, Jan van Riebeeck established a refreshment station at the Cape of Good Hope on behalf of the Dutch East India Company. The Dutch transported slaves from Indonesia, Madagascar, and India as labour for the colonists in Cape Town. As they expanded east, the Dutch settlers met the south-westerly expanding Xhosa people in the region of the Fish River. A series of wars, called the Cape Frontier Wars, ensued, mainly caused by conflicting land and livestock interests. Great Britain took over the Cape of Good Hope area in 1795, ostensibly to stop it from falling under Revolutionary French control. Given its standing interests in Australia and India, Great Britain wanted to use Cape Town as an interim port for its merchants' long voyages. The British returned Cape Town to the Dutch in 1803, but soon afterwards the Dutch East India Company declared bankruptcy. The British annexed the Cape Colony in 1806. The British continued the frontier wars against the Xhosa, pushing the eastern frontier eastward through a line of forts established along the Fish River. They consolidated the territory by encouraging British settlement. Due to pressure of abolitionist societies in Britain, the British parliament first stopped its global slave trade with the passage of the Slave Trade Act 1807, then abolished slavery in all its colonies with the Slavery Abolition Act 1833. During the 1830s, approximately 12,000 Boers (later known as Voortrekkers), departed from the Cape Colony, where they had been subjected to British control. They migrated to the future Natal, Orange Free State and Transvaal regions. The Boers founded the Boer Republics: the South African Republic (Now Gauteng, Limpopo, Mpumalanga and North West provinces) and the Orange Free State (Free State). The discovery of diamonds in 1867 and gold in 1884 in the interior encouraged economic growth and immigration. This intensified the European-South African subjugation of the indigenous people. The struggle to control these important economic resources was a factor between Europeans and the indigenous population, and also between the Boers and the British. The Boer Republics successfully resisted British encroachments during the First Boer War (1880–1881) using guerrilla warfare tactics, which were well suited to local conditions. However, the British returned with greater numbers, more experience, and more suitable tactics in the Second Boer War (1899–1902). The Boers' attempt to ally themselves with German South-West Africa provided the British with yet another excuse to take control of the Boer Republics. After four years of negotiating, the Union of South Africa was created from the Cape and Natal colonies, as well as the republics of Orange Free State and Transvaal, on 31 May 1910, exactly eight years after the end of the Second Boer War. The newly created Union of South Africa was a dominion of Great Britain. The Natives' Land Act of 1913 severely restricted the ownership of land by 'blacks'; at that stage they had control of a mere 7% of the country. The amount of land reserved for indigenous peoples was later marginally increased. In 1931 the union was effectively granted independence from the United Kingdom with the passage of the Statute of Westminster, which morphed the British king's position within South Africa into that of the distinct King of South Africa. In 1934, the South African Party and National Party merged to form the United Party, seeking reconciliation between Afrikaners and English-speaking ‘Whites’. In 1939 the party split over the entry of the Union into World War II as an ally of the United Kingdom, a move which the National Party followers strongly opposed. In 1948, the National Party was elected to power. It intensified the implementation of racial segregation begun under Dutch and British colonial rule, and subsequent South African governments since the Union was formed. The Nationalist Government systematised existing segregationist laws, classifying all peoples into three races, developing rights and limitations for each, such as pass laws and residential restrictions. The white minority controlled the vastly larger black majority. The system of segregation became known collectively as apartheid. Not surprisingly, this segregation meant that whites controlled the wealth generated during rapid industrialisation of the 1950s, '60s, and '70s. While the White minority enjoyed the highest standard of living in all of Africa, often comparable to First World western nations, the Black majority remained disadvantaged by almost every standard, including income, education, housing, and life expectancy. On 31 May 1961, following a whites-only referendum, the country became a republic and left the (British) Commonwealth. The office of Governor-General was abolished and replaced with the position of State President. Apartheid became increasingly controversial, leading to widespread sanctions, divestment and growing unrest and oppression within South Africa. A long period of harsh suppression by the government, and at times violent resistance, strikes, marches, protests, and sabotage by bombing and other means, by various anti-apartheid movements, most notably the African National Congress (ANC), followed. In the late 1970s, South Africa began a programme of nuclear weapons development. In the following decade, it produced six deliverable nuclear weapons. The rationale for the nuclear arsenal is disputed. Some commentators believed that leaders Vorster and P.W. Botha wanted to be able to catalyse American intervention in the event of a war between South Africa and the Cuban-supported MPLA government of Angola. In 1990 the National Party government took the first step towards negotiating itself out of power when it lifted the ban on the African National Congress and other left-wing political organisations. It released Nelson Mandela from prison after twenty-seven years' incarceration on a sabotage sentence. The government repealed apartheid legislation. South Africa destroyed its nuclear arsenal and acceded to the Nuclear Non-Proliferation Treaty. South Africa held its first multi-racial elections in 1994, which the ANC won by an overwhelming majority. It has been in power ever since. In post-apartheid South Africa, millions of South Africans, mostly black, have continued to live in poverty, as it has been difficult to compensate quickly for generations of educational and social neglect. Poverty among whites, previously rare, has increased greatly. While some have attributed this partly to the legacy of the apartheid system, increasingly many attribute it to the failure of the current government to tackle social issues. In addition, the current government has struggled to achieve the monetary and fiscal discipline to ensure both redistribution of wealth and economic growth. Since the ANC-led government took power, the United Nations Human Development Index of South Africa has fallen, while it was steadily rising until the mid-1990s. Some of this could possibly be attributed to the AIDS pandemic and the failure of the government to take steps to address it. South Africa has three capital cities: Cape Town, the largest of the three, is the legislative capital; Pretoria is the administrative capital; and Bloemfontein is the judicial capital. South Africa has a bicameral parliament: the National Council of Provinces (the upper house) has 90 members, while the National Assembly (the lower house) has 400 members. Members of the lower house are elected on a population basis by proportional representation: half of the members are elected from national lists and the other half are elected from provincial lists. Ten members are elected to represent each province in the National Council of Provinces, regardless of the population of the province. Elections for both chambers are held every five years. The government is formed in the lower house, and the leader of the majority party in the National Assembly is the President. The primary sources of South Africa law are Roman-Dutch mercantile law and personal law with English Common law, as imports of Dutch settlements and British colonialism. The first European based law in South Africa was brought by the Dutch East India Company and is called Roman-Dutch law. It was imported before the codification of European law into the Napoleonic Code and is comparable in many ways to Scots law. This was followed in the 19th century by English law, both common and statutory. Starting in 1910 with unification, South Africa had its own parliament which passed laws specific for South Africa, building on those previously passed for the individual member colonies. Since the end of apartheid in 1994, South African politics have been dominated by the African National Congress (ANC), which has been the dominant party with 60-70% of the vote. The main challenger to the rule of the ANC is the Democratic Alliance party, which received 16.7% of the vote in the 2009 election and 14.8% in the 2006 election. The formerly dominant New National Party, which introduced apartheid through its predecessor, the National Party, chose to merge with the ANC on 9 April 2005. Other major political parties represented in Parliament are the Congress of the People, which split from the ANC and won 7.4% of the vote in 2009, and the Inkatha Freedom Party, which mainly represents Zulu voters and took 4.6% of the vote in the 2009 election. Since 2004, the country has had many thousands of popular protests, some violent, making it, according to one academic, the ‘most protest-rich country in the world’. Many of these protests have been organised from the growing shanty towns that surround South African cities. Since the end of apartheid, the South African foreign policy has focused on its African partners particularly in the Southern African Development Community (SADC) and the African Union. South Africa has played a key role as a mediator in African conflicts over the last decade, such as in Burundi, the Democratic Republic of Congo, the Comoros, and Zimbabwe. After apartheid ended, South Africa was readmitted to the Commonwealth of Nations. As the Union of South Africa, South Africa was a founding member of the United Nations and the then Prime Minister Jan Smuts wrote the preamble to its constitution. South Africa is currently a non-permanent member of the United Nations Security Council and has attracted controversy by voting against a resolution criticising the Burmese government in 2006 and against the implementation of sanctions against Zimbabwe in 2008. 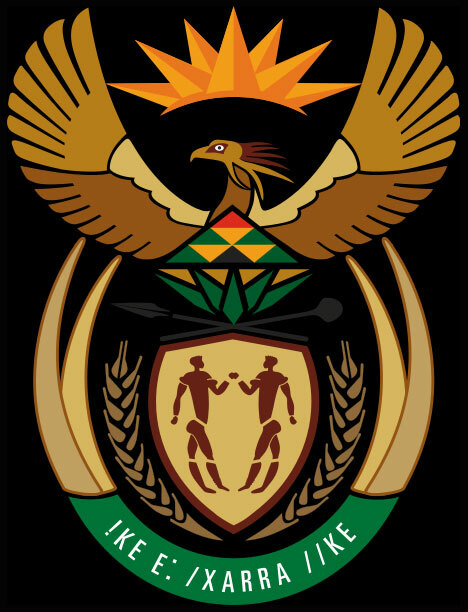 South Africa is a member of the Group of 77 and chaired the organisation in 2006. South Africa is a member of the South Atlantic Peace and Cooperation Zone, Southern African Customs Union, World Trade Organization, International Monetary Fund, G20 and G8+5. The South African armed forces, known as the South African National Defence Force (SANDF), was created in 1994. Previously known as the South African Defence Force (SADF), the new force is an all volunteer army and consists of the forces of the old SADF, as well as the forces of the African nationalist groups, namely Umkhonto we Sizwe (MK), Azanian People's Liberation Army (APLA), and the former Bantustan defence forces. The SANDF is subdivided into four branches, the South African Army, the South African Air Force, the South African Navy, and the South African Military Health Services. South Africa undertook a nuclear weapons programme in the 1970s and may have conducted a nuclear test over the Atlantic in 1979. It is the only African country to have successfully developed nuclear weapons. It has become the first country (followed by Ukraine) with nuclear capability to voluntarily renounce and dismantle its programme and in the process signed the Nuclear Non-Proliferation Treaty in 1991. When apartheid ended in 1994, the South African government had to integrate the formerly independent and semi-independent Bantustans into the political structure of South Africa. To this end, it abolished the four former provinces of South Africa (Cape Province, Natal, Orange Free State, and Transvaal) and replaced them with nine fully integrated provinces. The new provinces are usually much smaller than the former provinces, which theoretically gives local governments more resources to distribute over smaller areas. South Africa is located at the southernmost region of Africa, with a long coastline that stretches more than 2,500 kilometres (1,550 mi) and across two oceans (the South Atlantic and the Indian). 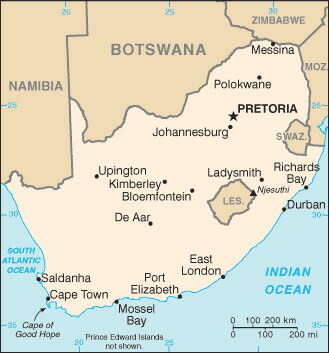 At 470,979 sq mi (1,219,912 km²), South Africa is the 25th-largest country in the world (after Mali). It is comparable in size to Colombia. Njesuthi in the Drakensberg at 3,408 m (11,424 ft) is the highest peak in South Africa. View of the Drakensberg mountains, the highest mountain range in South Africa. The interior of South Africa is a vast, rather flat, and sparsely populated scrubland, Karoo, which is drier towards the northwest along the Namib desert. In contrast, the eastern coastline is lush and well-watered, which produces a climate similar to the tropics. The extreme southwest has a climate remarkably similar to that of the Mediterranean with wet winters and hot, dry summers, hosting the famous Fynbos Biome. This area also produces much of the wine in South Africa. This region is also particularly known for its wind, which blows intermittently almost all year. The severity of this wind made passing around the Cape of Good Hope particularly treacherous for sailors, causing many shipwrecks. Further east on the south coast, rainfall is distributed more evenly throughout the year, producing a green landscape. This area is popularly known as the Garden Route. The high Drakensberg mountains, which form the south-eastern escarpment of the Highveld, offer limited skiing opportunities in winter. The coldest place in South Africa is Sutherland in the western Roggeveld Mountains, where midwinter temperatures can reach as low as −15 degrees Celsius (5 °F). The deep interior has the hottest temperatures: A temperature of 51.7 °C (125 °F) was recorded in 1948 in the Northern Cape Kalahari near Upington. South Africa is one of only 17 countries worldwide considered megadiverse. It has more than 20,000 different plants, or about 10% of all the known species of plants on Earth, making it particularly rich in plant biodiversity. South Africa is the 6th most biodiverse country, after Brazil, Colombia, Indonesia, China, and Mexico. The most prevalent biome in South Africa is the grassland, particularly on the Highveld, where the plant cover is dominated by different grasses, low shrubs, and acacia trees, mainly camel-thorn and whitethorn. Vegetation becomes even more sparse towards the northwest due to low rainfall. There are several species of water-storing succulents like aloes and euphorbias in the very hot and dry Namaqualand area. The grass and thorn savannah turns slowly into a bush savannah towards the north-east of the country, with denser growth. There are significant numbers of baobab trees in this area, near the northern end of Kruger National Park. While South Africa has a great wealth of flowering plants, it has few forests. Only 1% of South Africa is forest, almost exclusively in the humid coastal plain along the Indian Ocean in KwaZulu-Natal (see KwaZulu-Cape coastal forest mosaic). There are even smaller reserves of forests that are out of the reach of fire, known as montane forests. Plantations of imported tree species are predominant, particularly the non-native eucalyptus and pine. South Africa has lost a large area of natural habitat in the last four decades, primarily due to overpopulation, sprawling development patterns and deforestation during the nineteenth century. South Africa is one of the worst affected countries in the world when it comes to invasion by alien species with many (e.g. Black Wattle, Port Jackson, Hakea, Lantana and Jacaranda) posing a significant threat to the native biodiversity and the already scarce water resources. The original temperate forest that met the first European settlers to South Africa was exploited ruthlessly until only small patches remained. Currently, South African hardwood trees like Real Yellowwood (Podocarpus latifolius), stinkwood (Ocotea bullata), and South African Black Ironwood (Olea laurifolia) are under government protection. Numerous mammals are found in the bushveld habitats including lions, leopards, white rhinos, blue wildebeest, kudus, impalas, hyenas, hippopotamus and giraffes. A significant extent of the bushveld habitat exists in the north-east including Kruger National Park and the Mala Mala Reserve, as well as in the far north in the Waterberg Biosphere. By UN classification South Africa is a middle-income country with an abundant supply of resources, well-developed financial, legal, communications, energy, and transport sectors, a stock exchange (the JSE Limited), that ranks among the top twenty in the world, and a modern infrastructure supporting an efficient distribution of goods to major urban centres throughout the entire region. South Africa is ranked 25th in the world in terms of GDP (PPP) as of 2007. Advanced development is significantly localised around four areas: Cape Town, Port Elizabeth, Durban, and Pretoria/Johannesburg. Beyond these four economic centres, development is marginal and poverty is still prevalent despite government efforts. Consequently the vast majority of South Africans are poor. However, key marginal areas have experienced rapid growth recently. Such areas include Mossel Bay to Plettenberg Bay; Rustenburg area; Nelspruit area; Bloemfontein; Cape West Coast; and the KwaZulu-Natal North Coast. Even though South Africa has one of the higher income per capitas in Africa, it suffers from large income gaps and a dual economy marking it as a developing country. South Africa has one of the highest rates of income inequality in the world. A decade of continual economic growth has helped to lower unemployment, but daunting economic and social problems remain. The average South African household income decreased considerably between 1995 and 2000. As for racial inequality, Statistics South Africa reported that in 1995 the average white household earned four times as much as the average black household. In 2000 the average white household was earning six times more than the average black household. The affirmative action policies have seen a rise in black economic wealth and an emerging black middle class. Other problems are crime, corruption, and HIV/AIDS. At the start of 2000, then President Thabo Mbeki vowed to promote economic growth and foreign investment by relaxing restrictive labour laws, stepping up the pace of privatisation, and cutting unneeded governmental spending. His policies face strong opposition from organised labour. South Africa is also the largest energy producer and consumer on the continent. South Africa is a popular tourist destination, and a substantial amount of revenue comes from tourism. Among the main attractions are the diverse and picturesque culture, the game reserves and the highly regarded local wines. Principal international trading partners of South Africa — besides other African countries — include Germany, the United States, China, Japan, the United Kingdom and Spain. Chief exports include corn, diamonds, fruits, gold, metals and minerals, sugar, and wool. Machinery and transportation equipment make up more than one-third of the value of the country’s imports. Other imports include chemicals, manufactured goods, and petroleum. After unsuccessful attempts by the government to encourage private construction of electricity generation capacity, in 2007 the state-owned electricity supplier (Eskom) started experiencing a lack of capacity in the electrical generating and reticulation infrastructure. This led to an inability to meet the routine demands of industry and consumers, resulting in countrywide rolling blackouts. Initially the lack of capacity was triggered by a failure at Koeberg nuclear power station, but since then a general lack of capacity became evident. The supplier has been widely criticised for failing to adequately plan for and construct sufficient electrical generating capacity, although ultimately the government has admitted that it is at fault for refusing to approve funding for investment in infrastructure. The crisis was resolved within a few months, but the margin between national demand and available capacity is still low (particularly in peak hours) and power stations are under strain, meaning another phase of rolling blackouts is probable if parts of the supply are halted for whatever reason. Government and Eskom are currently planning new power stations. The power utility plans to have 20 000MW of nuclear power in its grid by 2025. South Africa has a large agricultural sector and is a net exporter of farming products. There are almost a thousand agricultural cooperatives and agribusinesses throughout the country, and agricultural exports have constituted 8% of South African total exports for the past five years. The agricultural industry contributes around 10% of formal employment, relatively low compared to other parts of Africa, as well as providing work for casual labourers and contributing around 2.6% of GDP for the nation. However, due to the aridity of the land, only 13.5% can be used for crop production, and only 3% is considered high potential land. In recent years, the agricultural sector has introduced several reforms, some of which are controversial, such as land reform and the deregulation of the market for agricultural products. Land reform has been criticised both by farmers' groups and by landless workers, the latter alleging that the pace of change has not been fast enough, and the former alleging racist treatment and expressing concerns that a similar situation to Zimbabwe's land reform policy may develop, a fear exacerbated by comments made by deputy president, the deputy president of South Africa. The sector continues to face problems, with increased foreign competition and crime being two of the major challenges for the industry. The government has been accused of either putting in too much effort, or not enough effort, to tackle the problem of farm attacks as opposed to other forms of violent crime. Another issue which affects South African agriculture is environmental damage caused by misuse of the land and global climate change. South Africa is unusually vulnerable to climate change and resultant diminution of surface waters. Some predictions show surface water supply could decrease by 60% by the year 2070 in parts of the Western Cape. To reverse the damage caused by land mismanagement, the government has supported a scheme which promotes sustainable development and the use of natural resources. Maize production, which contributes to a 36% majority of the gross value of South Africa’s field crops, has also experienced negative effects due to climate change. The estimated value of loss, which takes into consideration scenarios with and without the carbon dioxide fertilisation effect, ranges between 10’s to 100’s of millions of Rands. Population density by municipality. The western half of South Africa is sparsely populated, while the eastern half has a high population concentration. South Africa is a nation of more than 48 million people of diverse origins, cultures, languages, and religions. The last census was held in 2001 and the next will be in 2011. Statistics South Africa provided five racial categories by which people could classify themselves, the last of which, ‘unspecified/other’ drew negligible responses, and these results were omitted. The 2006 midyear estimated figures for the other categories were Black African at 79.5%, White at 9.2%, Coloured at 8.9%, and Indian or Asian at 2.5%. Even though the population of South Africa has increased in the past decade (primarily due to immigration), the country had an annual population growth rate of −0.501% in 2008 (CIA est. ), including immigration. South Africa is home to an estimated 5 million illegal immigrants, including some 3 million Zimbabweans. A series of anti-immigrant riots occurred in South Africa beginning on 11 May 2008. The white population is not ethnically homogeneous and descend from many ethnic groups: Dutch, Flemish, Portuguese, German, French Huguenot, English, Irish, Italian, Scottish and Welsh. Culturally and linguistically, they are divided into the Afrikaners, who speak Afrikaans, and English-speaking groups, many of whom are descended from British and Irish immigrants (see Anglo-African). Many small communities that have immigrated over the last century retain the use of other languages. The white population is on the decrease due to a low birth rate and emigration; as a factor in their decision to emigrate, many cite the high crime rate and the affirmative action policies of the government. Since 1994, approximately 1,000,000 white South Africans have permanently emigrated. Despite high emigration levels, a high level of non-South African white immigrants have settled in the country, in particular from countries such as Britain and Zimbabwe. For example, by 2005, an estimated 212,000 British citizens were residing in South Africa. Since 2003, the numbers of British migrants coming to South Africa has risen by 50%. An estimated 20,000 British migrants moved to South Africa in 2007. There have also been a significant number of white Zimbabwean arrivals, fleeing their home country in light of the economic and political problems currently facing the country. As well as recent arrivals, a significant number of white Zimbabweans emigrated to South Africa in the wake of independence in Zimbabwe in 1980. Some of the more nostalgic members of the community are known in popular culture as ‘Whenwes’, because of their nostalgia for their lives in Rhodesia ‘when we were in Rhodesia’. The term Coloured is still largely used for the people of mixed race descended from slaves brought in from East and Central Africa, the indigenous Khoisan who lived in the Cape at the time, Bantus, Whites (mostly the Dutch/Afrikaner and British settlers) as well as an admixture of Javanese, Malay, Indian, Malagasy and Asian blood (such as Burmese). The majority speak Afrikaans. Khoisan is a term used to describe two separate groups, physically similar: light-skinned and small in stature. The Khoikhoi, who were called Hottentots by the Europeans, were pastoralists and were annihilated; the San, called Bushmen by the Europeans, were hunter-gatherers. Within the Coloured community, more recent immigrants will also be found: Coloureds from the former Rhodesia (now Zimbabwe); Namibia and immigrants of mixed descent from India and Burma (Anglo-Indians/Anglo-Burmese) who were welcomed to the Cape when India and Burma received their Independence. The major part of the South African Asian population is Indian in origin (see Indian South Africans); many of them descended from indentured workers brought in the nineteenth century to work on the sugar plantations of the eastern coastal area then known as Natal. There is also a significant group of Chinese South Africans (approximately 100,000 individuals) and Vietnamese South Africans (approximately 50,000 individuals). In 2008, the Pretoria High Court has ruled that Chinese South Africans who arrived before 1994 are to be reclassified as Coloureds. As a result of this ruling, about 12,000 - 15,000 ethnically Chinese citizens who arrived before 1994, numbering 3%-5% of the total Chinese population in the country, will be able to benefit from government BEE policies. South Africa hosts a sizeable refugee and asylum seeker population. According to the World Refugee Survey 2008, published by the U.S. Committee for Refugees and Immigrants, this population numbered approximately 144,700 in 2007. Groups of refugees and asylum seekers numbering over 10,000 included people from Zimbabwe (48,400), The Democratic Republic of the Congo (24,800), and Somalia (12,900). These populations mainly lived in Johannesburg, Pretoria, Durban, Cape Town, and Port Elizabeth. Several important scientific and technological developments have originated in South Africa. The first human to human heart transplant was performed by cardiac surgeon Christiaan Barnard at Groote Schuur Hospital in December 1967. Max Theiler developed a vaccine against Yellow Fever, Allan McLeod Cormack pioneered x-ray Computed tomography, and Aaron Klug developed crystallographic electron microscopy techniques. These advancements were all recognised with Nobel Prizes. Sydney Brenner won most recently, in 2002, for his pioneering work in molecular biology. Mark Shuttleworth founded an early Internet security company Thawte, that was subsequently bought out by world-leader VeriSign. Despite government efforts to encourage entrepreneurship in biotechnology, IT and other high technology fields, no other notable groundbreaking companies have been founded in South Africa. However, it is the expressed objective of the government to transition the economy to be more reliant on high technology, based on the realisation that South African cannot compete with Far Eastern economies in manufacturing, nor can the republic rely on its mineral wealth in perpetuity. South Africa has cultivated a burgeoning astronomy community. It hosts the Southern African Large Telescope, the largest optical telescope in the southern hemisphere. South Africa is currently building the Karoo Array Telescope as a pathfinder for the $20 billion Square Kilometer Array project. South Africa is a finalist, with Australia, to be the host of the SKA. It may be argued that there is no ‘single’ culture in South Africa because of its ethnic diversity. Today, the diversity in foods from many cultures is enjoyed by all and especially marketed to tourists who wish to sample the large variety of South African cuisine. In addition to food, music and dance feature prominently. There is great diversity in music from South Africa. Many black musicians who sang in Afrikaans or English during apartheid have since begun to sing in traditional African languages, and have developed a unique style called Kwaito. Of note is Brenda Fassie, who launched to fame with her song ‘Weekend Special’, which was sung in English. More famous traditional musicians include Ladysmith Black Mambazo, while the Soweto String Quartet performs classic music with an African flavour. White and Coloured South African singers are historically influenced by European musical styles including such western metal bands such as Seether (formerly Saron Gas). South Africa has produced world-famous jazz musicians, notably Hugh Masekela, Jonas Gwangwa, Abdullah Ibrahim, Miriam Makeba, Jonathan Butler, Chris McGregor, and Sathima Bea Benjamin. Afrikaans music covers multiple genres, such as the contemporary Steve Hofmeyr and the punk rock band Fokofpolisiekar. Crossover artists such as Johnny Clegg and his bands Juluka and Savuka have enjoyed various success underground, publicly, and abroad. The South African black majority still has a substantial number of rural inhabitants who lead largely impoverished lives. It is among these people, however, that cultural traditions survive most strongly; as blacks have become increasingly urbanised and westernised, aspects of traditional culture have declined. Urban blacks usually speak English or Afrikaans in addition to their native tongue. There are smaller but still significant groups of speakers of Khoisan languages who are not included in the eleven official languages, but are one of the eight other officially recognised languages. There are small groups of speakers of endangered languages, most of which are from the Khoi-San family, that receive no official status; however, some groups within South Africa are attempting to promote their use and revival. The middle class lifestyle, predominantly of the white minority but with growing numbers of Black, Coloured and Indian people, is similar in many respects to that of people found in Western Europe, North America and Australasia. Members of the middle class often study and work abroad for greater exposure to the markets of the world. According to the latest 2001 national census, Christians accounted for 79.7% of the population. This includes Zion Christian 11.1%, Pentecostal (Charismatic) 8.2%, Roman Catholic 7.1%, Methodist 6.8%, Dutch Reformed 6.7%, Anglican 3.8%, and other Christian 36%. Islam accounted for 1.5% of the population, Hinduism about 1.3%, and Judaism 0.2%. 15.1% had no religious affiliation, 2.3% were other and 1.4% were unspecified. Islam in South Africa itself is not known to pre-date the colonial period, despite the isolated contact neighbouring Mozambique had with Arab and East African traders. There is no evidence that Islam was known to the Zulu, Swazi, or Xhosa of the east coast prior to the colonial era. Many South African Muslims are described as Coloureds, notably in the Western Cape, especially those whose ancestors came as slaves from the Indonesian archipelago (the Cape Malays). Others are described as Indians, notably in KwaZulu-Natal, including those whose ancestors came as traders from South Asia; they have been joined by others from other parts of Africa as well as white or black South African converts. It is estimated that Islam is the fastest growing religion of conversion in the country, with the number of black Muslims growing sixfold, from 12,000 in 1991 to 74,700 in 2004. Hinduism dates back to British Colonial period primarily but later waves of continuous immigrants from India have contributed to a sizeable Hindu population. Most Hindus are ethnically South Asian but there are many who come from mixed racial stock and many are converts with the efforts of Hindu missionaries such as ISKCON. Other religions in smaller numbers are Sikhism, Jainism and Bahá'í Faith. South Africa has eleven official languages: Sepedi, Sesotho, Setswana, siSwati, Tshivenda, Xitsonga, Afrikaans, English, isiNdebele, isiXhosa and isiZulu. In this regard it is second only to Bolivia and India in number. While each language is formally equal to every other, some languages are spoken more than others. According to the 2001 National Census, the three most spoken first home languages are Zulu (23.8%), Xhosa (17.6%) and Afrikaans (13.3%). Despite the fact that English is recognised as the language of commerce and science, it was spoken by only 8.2% of South Africans at home in 2001, an even lower percentage than in 1996 (8.6%). There are eleven official names for South Africa, one in each of the official national languages. The country also recognises eight non-official languages: Fanagalo, Khoe, Lobedu, Nama, Northern Ndebele, Phuthi, San and South African Sign Language. These non-official languages may be used in certain official uses in limited areas where it has been determined that these languages are prevalent. Nevertheless, their populations are not such that they require nationwide recognition. Many of the ‘unofficial languages’ of the San and Khoikhoi people contain regional dialects stretching northward into Namibia and Botswana, and elsewhere. These people, who are a physically distinct population from other Africans, have their own cultural identity based on their hunter-gatherer societies. They have been marginalised to a great extent, and many of their languages are in danger of becoming extinct. Many white South Africans also speak other European languages, such as Portuguese (also spoken by Angolan and Mozambican blacks), German, and Greek, while some Asians and Indians in South Africa speak South Asian languages, such as Tamil, Hindi, Gujarati, Urdu and Telugu. French is still widely spoken by French South Africans especially in places like Franschhoek, where many South Africans are of French origin. South African French is spoken by less than 10,000 individuals. Congolese French is also spoken in South Africa by migrants. The main sports in South Africa are soccer, rugby, cricket, boxing and lawn bowls. Other sports with significant support are swimming, golf and netball. Basketball, surfing and skateboarding are popular among the youth. Famous boxing personalities include Baby Jake Jacob Matlala, Vuyani Bungu, Welcome Ncita, Dingaan Thobela, Gerrie Coetzee and Brian Mitchell. Football players who have excelled in international clubs include Lucas Radebe of Leeds United and Quinton Fortune, formerly of Manchester United, Benni McCarthy and Aaron Mokoena of Blackburn Rovers and Steven Pienaar of Everton. South Africa produced Formula 1 motor racing's 1979 world champion Jody Scheckter. South Africa hosted and won the 1995 Rugby World Cup at their first attempt and again won the 2007 Rugby World Cup in France. South Africa was only allowed to participate from 1995 since the end of Apartheid. It followed the 1995 Rugby World Cup by hosting and winning the 1996 African Cup of Nations football tournament. It also hosted the 2003 Cricket World Cup and the 2007 World Twenty20 Championship. South Africa will be the host nation for the 2010 FIFA World Cup, which will be the first time the tournament is held on the African continent. In 2004, the swim team of Roland Schoeman, Lyndon Ferns, Darian Townsend and Ryk Neethling won the gold medal at the 2004 Olympic Games in Athens, simultaneously breaking the world record in the 4x100 freestyle relay. Penny Heyns won Olympic Gold in the 1996 Atlanta Olympic Games. In golf, Gary Player is generally regarded as one of the greatest golfers of all time, having won the Career Grand Slam, one of five golfers to have done so. Other South African golfers to have successfully won a major tournament include Bobby Locke, Ernie Els, Retief Goosen and Trevor Immelman. The spread of AIDS (acquired immuno-deficiency syndrome) is an alarming problem in South Africa with up to 31% of pregnant women found to be HIV infected in 2005 and the infection rate among adults estimated at 20%. The link between HIV, a virus spread primarily by sexual contact, and AIDS was long denied by prior president Thabo Mbeki and then health minister Manto Tshabalala-Msimang, who insisted that the many deaths in the country are due to malnutrition, and hence poverty, and not HIV. In 2007, in response to international pressure, the government made efforts to fight AIDS. In September 2008 Thabo Mbeki was ousted by the ANC and Kgalema Motlanthe was appointed for the interim. One of Mr. Motlanthe's first actions was to replace Mrs. Tshabalala-Msimang with the current minister, Barbara Hogan. According to a survey for the period 1998–2000 compiled by the United Nations, South Africa was ranked second for murder and first for assaults and rapes per capita. Total crime per capita is 10th out of the 60 countries in the data set. Along with many African nations, South Africa has been experiencing a ‘brain drain’ in the past 20 years. This is believed to be potentially damaging for the regional economy, and is almost certainly detrimental for the well-being of the majority of people reliant on the healthcare infrastructure, given the HIV/AIDS epidemic. The skills drain in South Africa tends to demonstrate racial contours (naturally given the skills distribution legacy of South Africa) and has thus resulted in large white South African communities abroad. In May 2008 long standing state hostility to African migrants exploded in a series of pogroms that left up to 100 people dead and 100,000 displaced.